Scalable engineered blood vessels would improve clinical applicability. 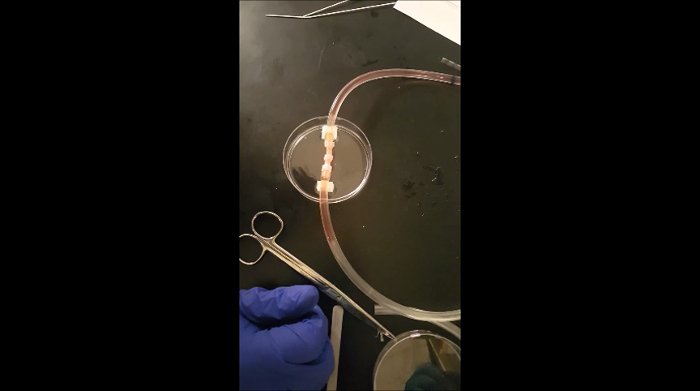 Using easily sizable 3D-printed guides, rings of vascular smooth muscle were created and stacked into a tubular form, forming a vascular graft. Grafts can be sized to meet the range of human coronary artery dimensions by simply changing the 3D-printed guide size. Pinnock, C. B., Xu, Z., Lam, M. T. Scaling of Engineered Vascular Grafts Using 3D Printed Guides and the Ring Stacking Method. J. Vis. Exp. (121), e55322, doi:10.3791/55322 (2017). Coronary artery disease remains a leading cause of death, affecting millions of Americans. With the lack of autologous vascular grafts available, engineered grafts offer great potential for patient treatment. However, engineered vascular grafts are generally not easily scalable, requiring manufacture of custom molds or polymer tubes in order to customize to different sizes, constituting a time-consuming and costly practice. Human arteries range in lumen diameter from about 2.0-38 mm and in wall thickness from about 0.5-2.5 mm. We have created a method, termed the "Ring Stacking Method," in which variable size rings of tissue of the desired cell type, demonstrated here with vascular smooth muscle cells (SMCs), can be created using guides of center posts to control lumen diameter and outer shells to dictate vessel wall thickness. These tissue rings are then stacked to create a tubular construct, mimicking the natural form of a blood vessel. The vessel length can be tailored by simply stacking the number of rings required to constitute the length needed. With our technique, tissues of tubular forms, similar to a blood vessel, can be readily manufactured in a variety of dimensions and lengths to meet the needs of the clinic and patient. In treatment of coronary artery disease (CAD), a patient's own blood vessels are harvested as graft material for bypass surgery. However, oftentimes, ill patients do not have viable vessels to donate to themselves, and in cases where they do, the donor site causes considerable additional harm and has a serious risk for infection.1 Engineered vascular grafts could fill this need. Scalability is of utmost importance for engineering vessels in order to meet the wide range of patient vessel size requirements. However, present methods for engineering vessels are not easily scalable, and typically require remanufacture of complex molds or polymer scaffolds. Most engineered grafts either utilize a polymer tubular scaffold that is seeded with vascular fibroblasts, smooth muscle, or endothelial cells; or rolling a cell sheet around a mandrel to create a tissue tube. Two engineered vascular grafts in clinical trials are based on a decellularized polymer-ECM platform.2,3,4 Polymer grafts available for use in vascular repair are already known to have issues with patency, which could arise as a major issue with long-term application of a graft with a sustained polymer presence. Tubular molds have been used to fabricate completely cellular vessels,5,6,7,8,9,10,11,12,13 which procedures would require additional design and tool manufacturing for custom molds in order to produce vessels in a variety of sizes. 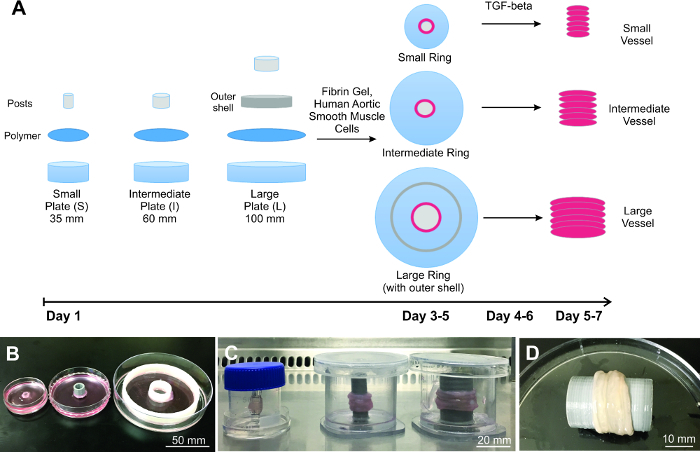 The method described herein encompasses a novel technique for creating easily scalable engineered vascular grafts using customizable 3D printed inserts and traditional culture plates.14 Cells are seeded into plates with inserts of a central post and outer shell. The post controls lumen diameter and allows the cell monolayer to self-assemble into a ring of tissue. The outer shell controls thickness of the ring, and thus wall thickness of the final vessel. Completed tissue rings are then stacked to form a tubular, vascular graft. The advantage to this method, termed the "Ring Stacking Method," is that any adherent cell type can be seeded into the plate setup and tissue rings or tubes of any size needed for the desired application can be generated by simply modifying guide inserts. Comparative techniques in tissue engineering creating rings of tissue remain difficult to scale,15,16 requiring remanufacture of molds for each desired size. Additionally, vascular grafts made using this method can be produced in 2-3 weeks, several weeks faster compared to other engineered vessels.6 For the clinic, this time discrepancy can make a significant difference in the treatment of a deteriorating patient. Utilize human aortic smooth muscle cells purchased commercially. Maintain cells in smooth muscle cell growth media composed of 88.6% 231 media, 0.1% each of recombinant human insulin (rH-insulin), recombinant human fibroblast growth factor (rH-FGF), recombinant human epidermal growth factor (rH-FGF), and ascorbic acid; and 5% each of fetal bovine serum (FBS) and L-glutamine; and 1% antibiotic/antimycotic. NOTE: Each growth factor, FBS and L-glutamine are purchased as a vascular media growth kit. Change media every 48 hours until the cells are about 90% confluent and ready for tissue seeding. Store cells in an incubator in between media changes for expansion. Use a commercial 3D printer (e.g., Replicator Mini) for 3D printing the plate inserts. Use open source 3D design software such as Blender to create the 3D models of the printed outer-shells and posts. Export the model's driver file via a .stl format allowing for portability to the 3D printer's software. Produce printed posts and outer shells using poly(lactic acid) filament (PLA) loaded into the 3D printer. Following printing, perform a 30-minute soak in a 70%-100% ethanol solution to sterilize each insert. Prepare a 1:10 curing agent to base polymer mixture of poly(dimethylsiloxane) (PDMS) silicone polymer and allow the mixture to degas at room temperature for 10 min. Define petri dish sizes used as small (35 mm), intermediate (60 mm), and large (100 mm). Add 2 mL, 4 mL and 6 mL of uncured silicone to each small, intermediate and large plate, respectively, and create a thin layer across the entire bottom of the petri dish. Create posts for the small plate by pouring PDMS into a 100 mm plate to a height of 7 mm and allow to cure on a hot plate at 60 °C for about 2-3 hours. Then use a 5 mm biopsy punch to punch out cylindrical posts. Use a small amount of uncured PDMS to secure each PDMS cylinder and to the center of each small plate. For the intermediate and large plates, prior to complete curing of the PDMS at the bottom of the plate, place the 3D printed posts 10 mm and 20 mm in diameter centrally into each intermediate and large plates, respectively. For the large plates, additionally place a 3D printed outer shell about 66.7 mm in diameter equidistance from the post. Allow each dish to cure in open air on a hot plate at 60 °C for about 2-3 hours, allowing 18 hours for degassing of the polymer. Fix printed components to the plate in the proper region and orientation as seen in Figure 1. Add a solution of 70% ethanol with 30% distilled water for 30 minutes to the inside of all plates for sterilization and then cover each plate. Carefully aspirate the ethanol from each plate and allow to air dry. Arrange each plate in a biological safety cabinet (BSC) next to its lid, face-up. Expose plates and lids to UV light under the BSC for 30 minutes to complete sterilization. Sterile technique is performed with every step after UV exposure. Mix a solution of fibrin gel containing growth media + 0.01% TGF-β1 in the amounts of 0.5 mL, 1.1 mL and 1.81 mL for small, intermediate and large plate sizes, respectively. Add 40 µL, 88.4 µL and 145 μL of thrombin, from a stock of 100 U/mL, to the media of each small, intermediate and large plate, respectively. Gently swirl each plate by hand to ensure that thrombin is evenly mixed within the media. Next, add 160 µL, 354 µL and 580 μL fibrinogen, from a stock of 20 mg/mL, drop-wise circularly to the thrombin-media mixture to each small, intermediate and large plate, respectively. Gently swirl by hand to ensure mixing and distribution of the hydrogel into an even layer. Allow hydrogel to cure for 10-15 minutes at room temperature. Trypsinize smooth muscle cells expanded in 150 mm cell culture plates and centrifuge according to standard protocols. The resulting pellet should be resuspended in 3 mL of differentiation media consisting of 98% - 231 media, 1% FBS and 1% antibiotic/antimycotic. Vigorously mix cells by titrating up and down with a 2 mL pipette to break up any cell clumps. Count cells with a hemocytometer and create a cell suspension of 2 x 106 cells/mL, 1.0 x 107 cells/mL and 1.4 x 107 cells/mL for small, intermediate and large plates, respectively. Add 1 mL of each cell suspension into a corresponding 50 mL conical labelled small, intermediate and large. Set up an additional 50 mL conical in this manner for each additional tissue ring desired. Add differentiation media to each conical to obtain final seeding volumes of 2 mL, 4 mL and 5 mL for each small, intermediate and large vessel, respectively. Then, carefully pipet the cell solution drop-wise on top of the prepared hydrogel in each corresponding plate. Place plates into the incubator at 37 °C and 5% CO2. Change differentiation media every 48-72 hours for each plate. In the case of the larger plate, change media initially after 24 hours, then change it every 48-24 hours to compensate for the large cell seeding density. After 2-4 days as the rings will have completely contracted in towards the post, add 10 µL, 20 µL and 35 μL of TGF-β1 to each small, intermediate and large ring, respectively. After exposure to TGF-β1 for at least 24 hours, rings are ready to be handled. Before the fabrication of the final vascular construct, a specialized container is created to hold the completed vessel. For the small vessel, create a tall plate for ring stacking by cutting a 2-inch section off the top of a 50 mL polycarbonate conical tube, and then PDMS glue the cut edge into a 35 mm plate. Use the conical lid as the plate lid. For the intermediate and large vessel tall ring stacking plates, cut a 1.75-inch diameter polycarbonate tube into 2.5 inch sections lengthwise to serve as the tall plate walls. For the tall plate bottoms, cut a 0.125-inch-thick polycarbonate sheet into 2-inch diameter circle pieces. Using acrylic solvent cement, bind the polycarbonate tube section to the circular cut piece. Use the lid from a 60 mm petri dish as the lid for the tall plate. 3D print posts 5, 10 and 20 mm in diameter and 50 mm in length. Add 10 mL of uncured silicone to each container. Prior to the complete curing of the PDMS, centrally place each post created in step 4.1.3 into each small, intermediate, and large container. Allow to cure on a hot plate set to 60 °C for 2-3 hours. Sterilize with a solution of 70% ethanol with 30% distilled water for 30 minutes. Carefully aspirate the ethanol from each container and then allow to air dry in the BSC. Next, arrange the containers in the hood with each plate placed next to its lid, face-up. Expose containers to UV light under the BSC for an additional 30 minutes for further sterilization. Use sterile technique with every step after UV exposure. Using very fine forceps, carefully remove each tightly rolled smooth muscle hydrogel ring from its post and transfer to its corresponding larger container with the tall posts. Use a pair of forceps in each hand and lift one side of the ring from the post, and then the other. Be careful to protect and maintain the lumen. Perform the transfer with this two handed method, sliding first one side, then the other side of the ring onto the tall post. Using gentle, gradual movements, and working circumferentially, slowly push the ring down onto the tall post. Subsequently stack tissue rings until the desired vessel length has been obtained, with each ring adding approximately 1-2 mm of length to the completed construct. With the ring stack positioned on the tall 3D printed posts, turn the plate so that the post is parallel with the working surface. Using a micropipette, add 40, 80 and 160 μL of thrombin at a concentration of 100 U/mL gently to the outer surface of each small, intermediate and large vessel, respectively. While adding the thrombin, slowly rotate the plate to ensure even coverage of all surfaces of the construct. This will be the base for the fibrin glue utilized to secure the ring stack construct in the initial days after construction. Next, add 40, 80 and 160 μL of fibrinogen at a concentration of 20 mg/mL to each small, intermediate, and large construct, respectively, using a micropipette while rotating the construct quickly. The thrombin and fibrinogen quickly set into a firm gel once mixed. Due to the short curing time, apply the fibrinogen as quickly and evenly as possible. Add 20 mL of differentiation media to each container holding the construct. Place vessels into a 37 °C incubator until needed. Change media every 3-5 days. Demonstrated here is fabrication of 3 different engineered vascular graft sizes (Figure 1), showing that the Ring Stacking Method (RSM) is scalable. To prove applicability, the 3 different vessel sizes chosen correlate to actual human vessel size for the left anterior descending artery (small; lumen diameter = 4 mm)17, descending aorta (intermediate; lumen diameter = 10 mm) and ascending aorta (large; lumen diameter = 20 mm)18. Wall thickness is about 500 µm for the small rings, and about 1,500 µm for both the intermediate and large rings. Each vessel demonstrated is built by stacking 6 rings, equating to a length of approximately 6 mm for the small vessel and 9 mm for the intermediate and large vessels. Length is based on the wall thickness of each individual ring. Histological analysis revealed high cellularity in all rings sizes (Figure 2). Red material demarcates fibrin gel. In small rings, a small amount of residual fibrin gel is seen on the outer edge of the ring. In the larger rings, some fibrin gel was interspersed with the cellular content. In the Masson's Trichrome stain, indications of collagen production (marked by blue) can be seen in the intermediate and large rings. To determine cell phenotype following ring formation, tissue rings were analyzed using immunofluorescence for antibodies to α-smooth muscle actin (SMA) and tropomyosin (Figure 3). All ring sizes were positive for both antibodies, verifying that the smooth muscle phenotype was maintained. Tensile testing was performed on the different sized rings to determine their mechanical properties (Figure 4). The U-stretch, a mechanical testing device, was used to tensile test small and intermediate rings and vessels, while an Instron was used to tensile test large rings and vessels. Elastic modulus (E), ultimate tensile strength (UTS) and failure strength (FS) data were collected. A consistent trend was observed with increasing strength correlating to increasing ring and vessel size. Cell seeding number needed for creating the varied sized rings increased approximately linearly with seeding surface area (Figure 5). In order to create larger rings, at least 14 million cells were needed to create the abdominal aorta sized rings. Six-ring stacks, or vessels, were tested for their ability to withstand flow. Constructs were loaded into a custom-built perfusion system (Figure 6) and subjected to flow for up to 5 min at flow rates from 100 to 417 mL/min. Vessels were able to withstand flow. Minor leaking was observed at the vessel ends, at the connectors to the perfusion system. Figure 1: Construction of the scaled engineered vessels. A) Diagram of the process of scaling engineered vessels, starting with plate preparation, cell seeding and vessel building. Demonstrated are three different sized B) rings and C) vessels. D) Representative large vessel is completely biological and resembles natural tissue. Please click here to view a larger version of this figure. Figure 2: Histological analysis. H&E and Masson's Trichrome stains show viable cellularity throughout the ring thickness for all ring sizes. Trichrome stains reveal areas of collagen production indicated by blue (blue arrows). Large rings showed fibrin gel interspersed, likely because of folding of the relatively larger surface area of the cell sheet. Scale bars: small rings = 200 µm; intermediate rings = 200 µm; and large rings = 0.5 mm. Please click here to view a larger version of this figure. 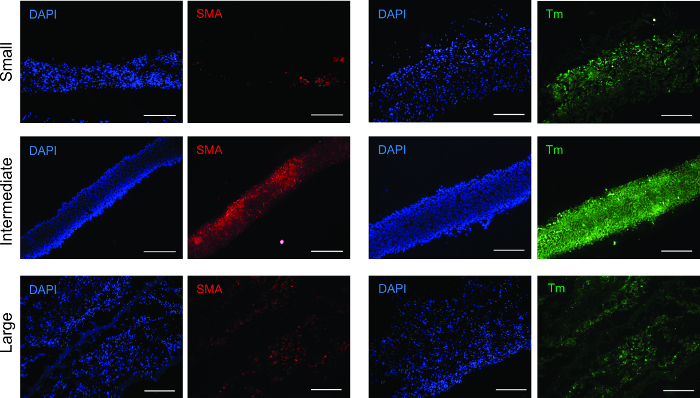 Figure 3: Immunofluorescence analysis for smooth muscle markers. All ring sizes were positive for smooth muscle contractile proteins α-smooth muscle actin (SMA) and tropomyosin (Tm). Scale bars = 200 µm. Please click here to view a larger version of this figure. Figure 4: Tensile testing analysis. Stress-strain curves for all sizes of rings and vessels showed a general trend of an increase in strength correlating with increase in ring/vessel size. Rings and vessels were stretched circumferentially. Parameters assessed from the graphs were elastic modulus, ultimate tensile strength and failure strength (listed in Table 1). Please click here to view a larger version of this figure. Figure 5: Cell seeding number correlation to seeding surface area. Based on human aortic smooth muscle cells. The surface area is defined as the area in the ring formation plates between the center post and the plate wall or outer shell. Please click here to view a larger version of this figure. Figure 6: Six-ring vessel subjected to perfusion analysis. A) Custom-built perfusion system for flow tests. B) Engineered vessel loaded into the perfusion system. Three vessels were perfusion tested for leaks for up to 5 min under flow conditions. The vessels remained stable under flow, with minor leaking at the vessel end-connectors attached to the system tubing. Please click here to view a larger version of this figure. Table 1: Tensile properties of the scaled rings and vessels. The Ring Stacking Method presents multiple advantages over current vascular tissue engineered construct techniques. The RSM can be adapted to create human vessels of any size by simply customizing the post and outer shell dimensions. Our method allows for development of polymer-free engineered vessels composed solely of human cells and rapidly degrading support material found in the body's natural wound healing process. Polymer grafts are known to cause restenosis in the clinic and could become problematic if contained in engineered grafts. Cell seeding number needs to be modified for each different size tissue ring. 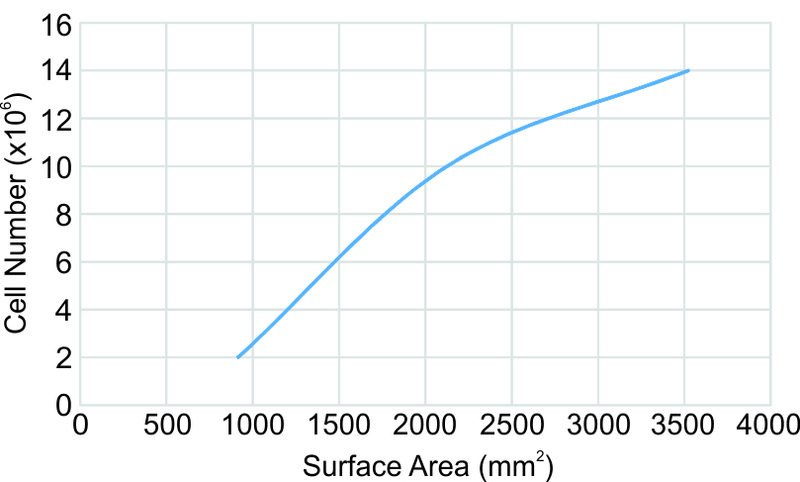 A graph of the cell number to the seeding surface area is shown in Figure 5 from which the seeding number can be approximated and/or extrapolated. It should be noted that the cell type used here are human aortic smooth muscle cells. To adapt the RSM to different cell types, cell size and proliferation rate need to be taken into consideration and optimal seeding density determined. For example, we have also created human fibroblast rings using the RSM, and have found that at least 2x the number of cells is needed compared to SMCs. Any desired length of vessel can be built through the addition of rings. Ring stacks have been cultured for up to 2 months and remained stable. Intermediate and large rings are both kept at the appropriate 1,500 µm wall thickness even though they are each constructed in a 60 mm and 100 mm plate, respectively, by placement of an outer shell in the 100 mm plate. This shows the utility of the outer shell for controlling and obtaining the appropriate wall thickness for a given vessel. In Step 3.3.1, TGF-β1 is added because it is known to stimulate collagen production19 and has the observed effect of tightening the rings. Once the rings have completely rolled, one dose of TGF-β1 is added in the final step, and the rings are ready for use 1 day later. TGF-β1 does enhance collagen production in the rings, as seen in the Trichrome images (Figure 2). Cells in the small rings are more round and compact, whereas in the 2 larger sizes, cells along the outer edges display a degree of alignment with the tissue edge and along with other aligned cells. The latter may indicate a later stage of cell maturity, evolved from higher cell content in the larger rings, and hence a greater degree of intercellular signaling to encourage maturity. Fibrin gel interspersion in larger rings may indicate that larger cell sheets tend to fold slightly as they roll. The histological images showing this phenomenon were taken 1 day following complete ring roll up- thus it is understandable that the fibrin gel, which takes 2 weeks to degrade in culture, would still be present. Culturing the rings for at least 2 weeks should degrade the fibrin gel, leaving behind a fully cellular construct. Alpha-smooth muscle actin (SMA) constitutes the thin filaments that facilitate contraction and tropomyosin is a contractile protein.20,21 Both SMA and tropomyosin were present in all size rings, with the strongest, most evenly distributed signal in the intermediate rings. This phenomenon may be due to a higher degree of cell density and organization, stimulating an increase in contractile operandi development. Elastic modulus indicates the elasticity of the rings, and the increasing E from small to large rings suggests an increase in collagen and elastin production. Ultimate tensile strength is the highest strength endured by the rings without breaking. Failure strength is the point of tissue failure. For the rings, UTS equals FS. For the vessels, UTS is greater than FS, which shows that the ultimate strength of the vessel is attributed to the combination of mechanical contribution from all rings in the vessel, and the failure point is due to the weakest ring. The strength of our engineered vessels lay in the kPa range, whereas native human vessels have strengths within the MPa range. In order to strengthen our vessels towards that of native vessels, we are investigating techniques to increase extracellular matrix production, namely that of collagen and elastin. Growth factors that promote collagen and elastin production are currently being applied to our rings to investigate whether tensile properties will increase. In addition to mechanical properties, functional measures of muscle contraction are relevant to vessel performance. Muscle stimulation and contraction by factors such as acetylcholine and epinephrine can be used to test muscle contractile force. Such experiments are being considered for our future studies. Overall, our results show that the Ring Stacking Method can be easily scaled to achieve a range of engineered vascular tissue sizes. Scaling to the largest human vessels, such as the 40 mm lumen diameter aorta, would likely require development of a vasa vasorum, the microvasculature naturally present within large sized vessels, which our lab is currently developing. In addition, the endothelial cell layer (i.e., the intima) that typically lines the lumen of the media layer is important for establishment of proper hemodynamics in a vessel. Our lab is currently working on creation of the intima in our SMC ring stack using human vascular endothelial cells. With these combined technologies, engineered vessels would have greater applicability to the clinic. The authors would like to thank our fellow Lam lab colleagues Ammar Chishti and Bijal Patel for their kind assistance with some of the histology and cell culture. Funding was provided by the Wayne State University Nanomedicine Fellowship (CBP), Start-Up Funds and Cardiovascular Research Institute Seed Grant (MTL). Luciani, G. B., et al. Operative risk and outcome of surgery in adults with congenital valve disease. ASAIO J. 54, (5), 458-462 (2008). Lawson, J. H., et al. Bioengineered human acellular vessels for dialysis access in patients with end-stage renal disease: two phase 2 single-arm trials. Lancet. 14, (387), 2026-2034 (2016). McAllister, T. N., et al. Effectiveness of haemodialysis access with an autologous tissue-engineered vascular graft: a multicentre cohort study. Lancet. 373, (9673), 1440-1446 (2009). Wystrychowski, W., et al. First human use of an allogeneic tissue-engineered vascular graft for hemodialysis access. J Vasc Surg. 60, (5), 1353-1357 (2014). Konig, G., et al. Mechanical properties of completely autologous human tissue engineered blood vessels compared to human saphenous vein and mammary artery. Biomaterials. 30, (8), 1542-1550 (2009). Gui, L., et al. Construction of tissue-engineered small-diameter vascular grafts in fibrin scaffolds in 30 days. Tissue Eng Part A. 20, (9-10), 1499-1507 (2014). Sundaram, S., Echter, A., Sivarapatna, A., Qiu, C., Niklason, L. Small-diameter vascular graft engineered using human embryonic stem cell-derived mesenchymal cells. Tissue Eng Part A. 20, (3-4), 740-750 (2014). Quint, C., Arief, M., Muto, A., Dardik, A., Niklason, L. E. Allogeneic human tissue-engineered blood vessel. J Vasc Surg. 55, (3), 790-798 (2012). Quint, C., et al. Decellularized tissue-engineered blood vessel as an arterial conduit. Proc Natl Acad Sci U S A. 31, (108), 9214-9219 (2011). Dahl, S. L., et al. Readily available tissue-engineered vascular grafts. Sci Transl Med. 2, (68), (2011). Syedain, Z. H., Meier, L. A., Lahti, M. T., Johnson, S. L., Tranquillo, R. T. Implantation of completely biological engineered grafts following decellularization into the sheep femoral artery. Tissue Eng Part A. 20, (11-12), 1726-1734 (2014). Syedain, Z. H., Meier, L. A., Bjork, J. W., Lee, A., Tranquillo, R. T. Implantable arterial grafts from human fibroblasts and fibrin using a multi-graft pulsed flow-stretch bioreactor with noninvasive strength monitoring. Biomaterials. 32, (3), 714-722 (2011). Meier, L. A., et al. 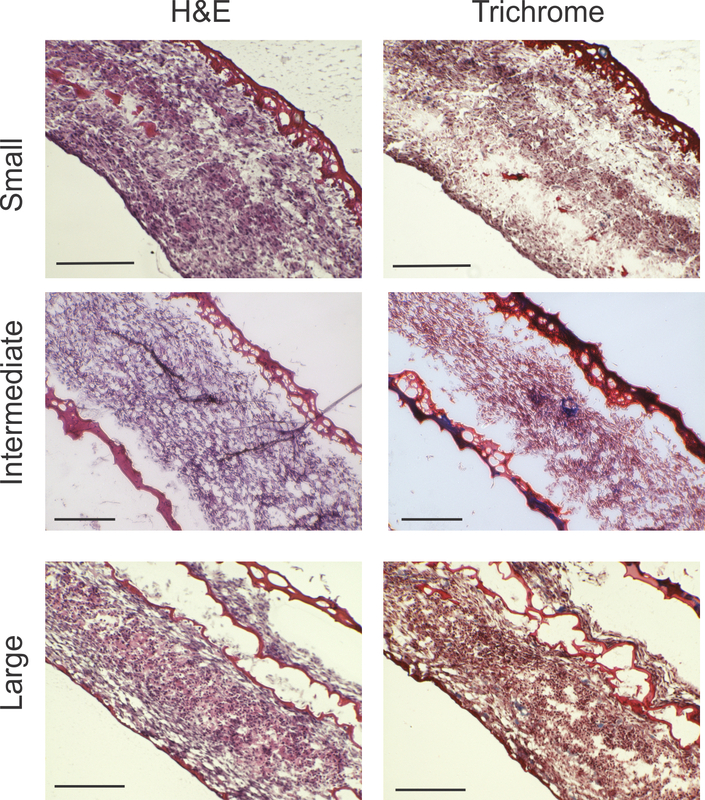 Blood outgrowth endothelial cells alter remodeling of completely biological engineered grafts implanted into the sheep femoral artery. J Cardiovasc Transl Res. 7, (2), 242-249 (2014). Pinnock, C. B., Meier, E. M., Joshi, N. N., Wu, B., Lam, M. T. Customizable engineered blood vessels using 3D printed inserts. Methods. S1046-2023, (15), 30184-30185 (2015). Blakely, A. M., Manning, K. L., Tripathi, A., Morgan, J. R. Bio-Pick, Place,and Perfuse: A New Instrument for Three-Dimensional Tissue Engineering. Tissue Eng Part C Methods. 21, (7), 737-746 (2015). Gwyther, T. A., et al. Engineered vascular tissue fabricated from aggregated smooth muscle cells. Cells Tissues Organs. 194, (1), 13-24 (2011). Fearon, W. F., et al. Changes in coronary arterial dimensions early after cardiac transplantation. Transplantation. 27, (6), 700-705 (2007). Erbel, R., Eggebrecht, H. Aortic dimensions and the risk of dissection. Heart. 92, (1), 137-142 (2006). Ha, D. M., et al. Transforming growth factor-beta 1 produced by vascular smooth muscle cells predicts fibrosis in the gastrocnemius of patients with peripheral artery disease. J Transl Med. 14, 39 (2016). Skalli, O., et al. Alpha-smooth muscle actin, a differentiation marker of smooth muscle cells, is present in microfilamentous bundles of pericytes. J Histochem Cytochem. 37, (3), 315-321 (1989). von der Ecken, J., et al. Structure of the F-actin-tropomyosin complex. Nature. 519, (7541), 114-117 (2015).